We understand how important your role is in helping students find the right college. Our goal is to provide all the resources you need as you help guide them toward their top-choice college. 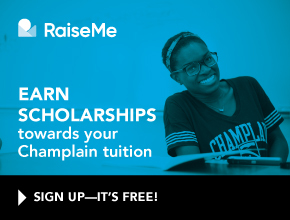 Champlain College—established in 1878 and located in Burlington, Vermont—is a national leader in preparing passionate students for rewarding careers and successful lives. If you or any of your students would like to visit our campus and take a tour, please contact the Office of Admissions at (802) 860-2727 or admission@champlain.edu. Or feel free to email one of our counselors.